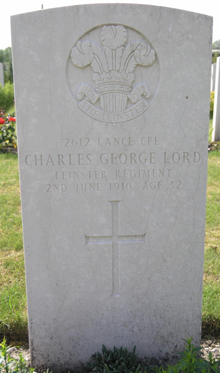 Charles George Lord was a son of Thomas and Mary E. Lord of Loy Street, Cookstown. 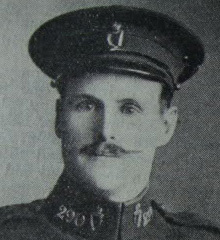 Although he lived in Cookstown, he enlisted while he was in Dublin. By the early summer of 1916 the 7th Leinsters were near Mazingarbhe and it was here that Charles was killed. He was the only casualty in his Battalion on that day and is buried in Philosophe British Military, Cemetery. Mazingarbhe, France.